The atmosphere in greece is always relaxed and informal, and pretensions (and expense-account prices) are rare outside of the more chi-chi parts of Athens and certain major resorts. On many Greek islands and cities there will be both hotels and rooms for rent. 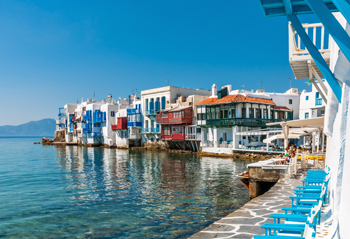 By May the weather in Greece is more generally predictable, and Crete, the Peloponnese, the Ionian islands and the Cyclades ( mykonos,santorini,paros,naxos, e.t.c ) are perhaps at their best for travel, even if the sea is still a little cool for swimming. Note, however, that these are the historical patterns as observed until the early 1990s; thanks to global warming, recent years have seen erratic climate, with unusually cold Mays, warm Octobers, little (and late) rain, plus very early spring flowering. 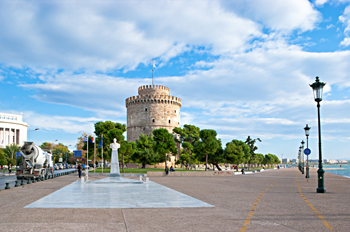 Other factors that affect the timing of your Greek travels have to do with the level of tourism and the amenities provided. Services standards, particularly in tavernas, slip under peak-season pressure, and room rates top out from July to September (as well as during Easter or Christmas week). If you can only visit or travel during midsummer, reserve a package well in advance, or plan your itinerary off the beaten track: you might for example explore the less obvious parts of the Peloponnese or the northern mainland, or island-hop with an eye for the remoter places.Out of season , especially between late October and late April, you have to contend with reduced ferry services to the islands (and nonexistent hydrofoils or catamarans), plus fairly skeletal facilities when you arrive in Greece. On secondary travel on roads they're less regular, with long gaps, but even the remotest villages will be connected - at least on weekdays.The flying dolphins are hydrofoil boats that buzz over the water at a fine pace. They are the interurbans of Greece, like some "doodlebug" traveling the rails in rural America a generation ago. The windows are always dirty, the noise is amazing, and the seats often sag.But they don't require an enormous infrastructure to start and run. The crew mingles with the passengers, the pilots talk to the cabin crew, and occasionally some very grime-smattered worker emerges from the bowls with a huge air filter or something to put away. At each stop you hear friends talk to each other. No one who travels to be seen would dare be caught on one. When you travel on a flying dolphin, you are in Greece, talking to Greeks. It is appropriate technology: fast enough but not overdone, still human scale that does not destroy the environment. And, like steam engines, and many ships, they have a soul.Greece is a wonderful, relatively safe place with access to the modern conveniences. 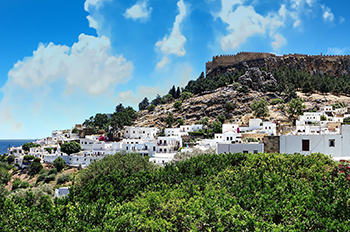 You will, however, find reasonable service on all main routes and at least one hotel and taverna open in the port or main town of all but the tiniest isles. On the mainland, winter travel poses no special difficulties except, of course, in mountain villages either cut off by snow or (at weekends especially) monopolized by avid Greek skiers. The standard overland public transport in Greece is the bus. Greek train networks are usually slow and limited, though services on the Athens-Pátra line and the northern mainland lines is improving. Buses, however, cover just about every route on the mainland - albeit infrequently on minor roads - and provide basic connections on the islands. The best way to supplement buses is to rent a scooter, full-sized motorbike or ( rent a car ), especially in travel on the islands, where in any substantial town or resort you can find a rental outlet.Inter-island travel of course means taking ferries. These again are extensive, and will eventually get you to any of the 166 inhabited isles. Greek planes are relatively expensive, at three to four times the cost of a deck-class ferry ticket and almost twice as much as the cheapest cabin berth. Buses. Bus services on the major routes , both on the mainland and islands, are highly efficient and frequent. In Athens, the ordinary safety skills of large American cities are needed, including watching for pickpockets at the airport. 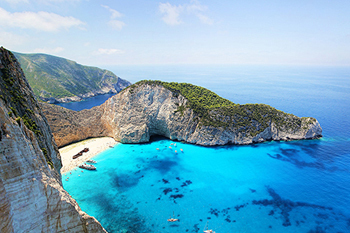 Greece is a paradise for photographers, so load up. The bright sun and saturated colors allow work with the higher quality slower speed films. New security measures are causing concern about film fogging in checked luggage by airport X-ray machines. We strongly recommend film be hand carried. There are ATM machines that take your bank cards just fine. The old standby of travelers checks are still good. 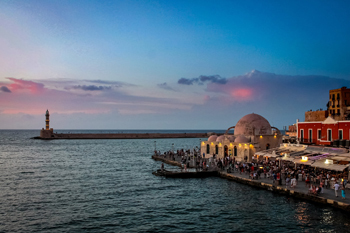 Tourism is a key industry in Greece. Like other countries that depend on it, they have a Minister of Tourism and government policy to tourism is of national political concern.